August 2013 – Shamwari Game Reserve, part of the Shamwari Group together with the Born Free Foundation have created the ‘Owl box Project’. The aim of this initiative is to educate schools and the surrounding communities about the significance of owls and how the owl population can be increased so that rodent numbers can be reduced. This new conservation program focuses on using the Spotted Eagle Owl and the Barn Owl as a natural rodent and insect control on the farms, in townships, lodges and the surrounding areas, instead of using pesticides and rodenticides, which is very dangerous for the wildlife, pets, children and whoever may come in contact with it. So far two schools were selected to partake in the program, Sandisulwazi High School from Paterson and Hendrik Kanise School from Alicedale. Each school’s eco-club was invited to visit the Addo Raptor and Reptile Park near Addo town and was educated about the various animals, birds (including owls and vultures) and snake species. Many had the opportunity to ask questions and conquered their fear after coming in contact with snakes and various reptile species. 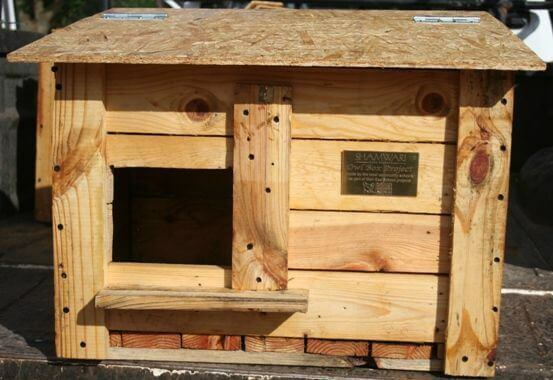 Each school has the task of building 10 owl boxes at the primary cost of R70 per box. 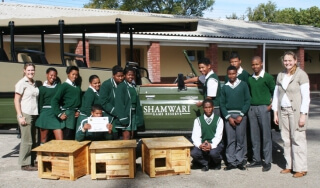 All the equipment and material needed is supplied to the schools by Shamwari Game Reserve and the Born Free Foundation. A demonstration is done at each school to illustrate how to construct the owl boxes and what the end product should look like. Shamwari Game Reserve then purchases the owl boxes from the school for R150 and the R80 profit is then used by the school for educational tours. Shamwari Game Reserve is happy to announce that they have received their first completed barn owl boxes which will be put up at the various lodges. The rest of the boxes will be done in due time and distributed all over the reserve, lodges and staff accommodation.